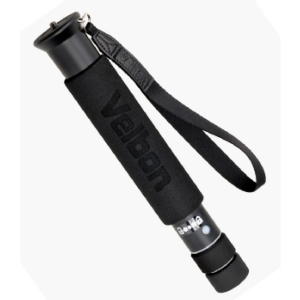 This versatile and super-portable eight-section monopod from Velbon can be extended and locked at any point between its closed and extended positions. Because it folds down to a tiny 26cm, it is an ideal travel support. The Ultra Stick Super 8 is an eight-section monopod which uses Velbon's unique twist-lock Trunnion Shaft System (TSS). You can lock the height at any point between closed and extended positions. This innovative design allows for a much more compact monopod of just 26cm when closed, while allowing for a greater maximum working height of 156cm. It weighs only 347g and can hold a maximum load of 3kg. Top leg diameter of 30mm. There's a 1/4 inch screw on top of the monopod, so you can attached your camera directly. You can also attach a head (sold separately – heads with a 3/8 inch thread will also need a separate bush adapter, sold separately). A wrist strap and belt clip are included. There's also a soft grip material on the upper part of the monopod for comfortable and secure handling. All-in-all, a versatile and travel-friendly monopod for when you need extra support for your EOS camera.